Whether you have had little or no success building niche websites or have never tried, without the following information you will most assuredly fail! Get comfortable, grab a pen and notepad, and pay attention. Once you have a basic idea of what type of website you plan to build, you then need to start doing research. The first bit of research that is crucial to success is assessing the competition. If you want to make money from a niche site, you need to target untapped niches or target markets that have a minimal amount of competition. Think about it. There are millions of websites out there. Some have been in business for 10 years or more. What makes you think you can come along, knock these guys off their throne, and dominate a niche? Go for a niche with little to no competition, trust me. How do you find a Niche that has Little Competition? Let’s assume you want to create a review website. You know quite a bit about cell phones and plan to review and recommend cell phones through Amazon or eBay. Right off the bat you are going to be competing with some pretty stiff competitors such as Gizmodo.com. What you need to do is narrow down your niche. Instead of reviewing all cell phones, choose a specific brand of cell phones. This may still be too competitive. Try narrowing your niche down even further for example to used or refurbished models of a particular cell phone. Keep going in this fashion until you find a highly specialized or “micro niche” that has little or no competition. Keywords are phrases or words that potential consumers will type into the search engine to find what they are looking for. Keeping with the example of cell phones, popular search terms may include iPhone 5, Samsung Galaxy, TracPhone, and so forth. The trick is to find keywords that get typed into search engines frequently but are not extremely competitive while making sure they reflect what your niche site is all about. This is what I call a “buying keyword”. In other words, this is a term people type in who are motivated to purchase an electric shaver. I recommend targeting one main buying keyword for the focus of your website and then building supporting pages and posts that relate to the main keyword. For example, best electric shaver is my primary keyword. Supporting keywords might be the “best electric shaver for men with sensitive skin”, or the “best foil shaver”. I then go even further and create pages that relate to the supporting keywords such as the “Panasonic ES8103S is the Best Shaver for Guys with Sensitive Skin”. Once you have done your research and have a good idea of what keywords will work best for your site, you will need to actually target these keywords. This means including your keyword in the title of a specific page or post, including the keyword within the first paragraph of that page or post, and making sure to include the keyword throughout the page or post. Of course, do not force this, the article should read naturally. Choosing the right keywords is not enough. You also need to structure your keywords throughout your website in a way that is SEO friendly. SEO or Search Engine Optimization basically means creating a webpage that search engines can easily navigate. The better your website ranks in the search engines for the keywords you are targeting, the more likely you will be able to convert all that traffic to paying customers. Having a solid on-page SEO structure is one aspect that can help. On-page SEO might include keyword optimized articles, keyword optimized categories, well researched and well written articles, and numerous other factors. There are also external SEO factors than need to be considered. One way search engines determine where a webpage shows up in the search results is factored by the number of relevant and quality links. A link is like a vote by another website saying, “hey, check this guy out, he knows what he’s talking about”. While incoming links are not the only factor they certainly are important. There are many ways of obtaining incoming links. One of the oldest and best methods for getting natural and quality incoming links is to create quality content. Other webmasters, bloggers, and Googler’s will find your awesome content and then share it because it is well written and relevant to them. For more on SEO or link building be sure to check out SEO 101. Another part of SEO that spills over into marketing your niche website is authority and trust. People don’t buy products they buy brands, and more specifically brands they trust. The best way to build trust is to build authority. You build authority by writing well researched, honest, and relevant content. Beyond writing and research, you need to build your online presence and the best way to do that is through social media. Social media has the ability to bring visibility to a brand. If you use social media effectively, you will begin to build a reputation for “the guy who reviews electric shavers”. Not only will this serve to increase your trust factor, but it will also move you in the direction of becoming an authority in the eyes of search engines such as Google. Authority and trust are probably the most two important factors for creating a successful niche website. So get out there, start making a name for yourself in your chosen niche, rub elbows with others who also blog about your niche, and always be honest! Trust is important. If you review a product you have either never tried or have not done adequate research on, don’t give a recommendation! Remember, you need to build trust and become an authority. Take the time to try products and do thorough research. The final ingredient to a successful niche website ties in with research and SEO and that is sustainability. If you chose to create a niche site about portable CD players 10 years ago you probably would have made a decent amount of money. Try that now and you will be wasting your time. You need to target a niche that always has potential for growth. For example, guys will always shave. While the technology of shavers may change, my review site is capable of evolving with the technology whereas if you pick a specific product, the shelf life is unpredictable. Along with choosing an evergreen product, it is also a good idea to choose a product or niche that you are passionate or very curious about. That way, you don’t get bored or run out of ideas for creating content. There you have it! 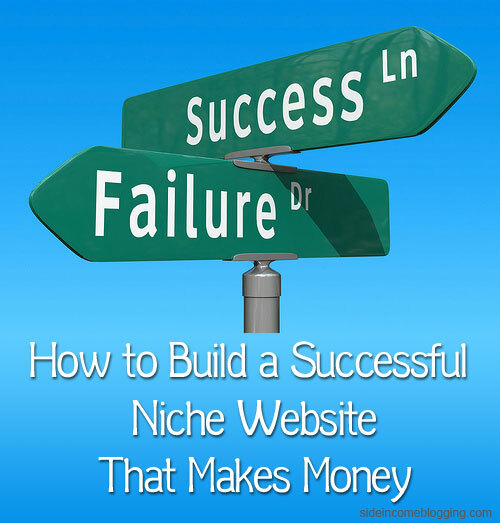 Those are the key components to creating a successful niche website that will make you money. If you don’t see results right away, don’t get discouraged. Keep up with your research, build authority and trust, work on SEO, and never give up! Not every niche site will be a winner no matter how hard you work at it. However, everyone has the potential to build a successful niche website by following the simple guidelines outlined above. Jason Hill is an aspiring blogger and online entrepreneur. Jason is passionate about helping others and always loves a good challenge. Be sure to connect with Jason on Google Plus. for them to build authority given that they have to start from scratch. they have no in depth experience professionally in the niche. I see lot of niche websites(like the one you described) being sold at flippa. Vinodh, I agree, it is difficult to build authority for those just starting out. However, that’s the beauty of social media, and more particularly Google Plus. If someone is willing to take the time to engage people on Google Plus with interests in their given niche, they can easily gain trust and become an authority in that niche. As far as outsourcing, that is also something that may not be viable for those starting out. Personally, I rarely outsource anything. I like doing my own research as well as write my own content. This also helps with building credibility, authority and trust. Thanks for your input Vinodh, I hope you enjoyed the article! Good points Larry and I am glad the article lead with research. People rush out into the market place without taking the time to understand demand, need, competition, etc. (myself included). Clarity of communication or your message. I think this is a piece of this too, thoughts? Sure Vinodh, that’s the case with everything that we start new. I agree on outsourcing and I think you learn far more by doing the work yourself. Tim, that was a good and interesting read, and I completely agree. It’s far more than just saying “Hi I’m here”. You have to give them value. This applies to blogging as well. I think research and value is what separates the successful, from the unsuccessful. Tim, I used to just assume that if I got enough traffic to my sites I would make money. While traffic helps, I need that traffic to convert. Often, this goes back to what you we’re saying about clarity of communication, knowing what the customer really wants, and then being able to meet those needs while being able to adapt and evolve along with the target market and the state of the market.